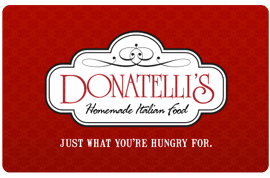 Donatelli’s Gift Cards are available in any amount from “oh thank you Mr. Scrooge” to “oh my gosh I’m not worthy”. And when you give a Donatelli’s Card you know you’re giving the gift they’re hungry for. Pick some up in-store. They’re the perfect gift all year long and the only gift they’ll never get fed up with. Please note: All gift card sales are final; no refunds will be processed.